Clifton Webb was one of the most extraordinary character actors in Hollywood history. After a hugely successful career on Broadway, he began making films for 20th Century-Fox, resulting in a string of hit films. His natty fastidiousness, once seen, is never forgotten. Webb's parents divorced when he was a baby. His mother, calling herself "Mabelle," moved to New York City, with her "little Webb" as she called him. Mabelle remarried around 1900, to a well-connected man named Green B. Raum, Jr.. Webb was sent to school, where he must have gravitated toward the stage. 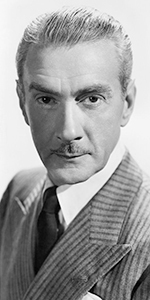 Tall, slender and graceful, Webb became a professional ballroom dancer, using the name Clifton Webb. He performed in several operettas before making his Broadway debut in The Purple Road in the 1913 season. Mabelle was in the show with him. His next show was the Al Jolson starring musical Dancing Around in the 1914-1915 season. Webb continued in supporting roles in musicals on Broadway for the next several years. He participated in a film made of Broadway notables in National Red Cross Pageant (released in December, 1917), but he much preferred the stage. A great success for him was Listen Lester, which ran for 272 perfs in the 1918-1919 season. He spent some time in England, appearing in an English production of the French musical Phi-Phi for almost 1,000 performances at the London Pavillion. Returning to the U.S. in 1923, Webb secured a large supporting role in Meet the Wife in the 1923-1924 season. Actress Mary Hay asked Webb to appear in a film she was making called New Toys (released in March, 1925); although the film was a hit, it was to be some time before Webb would appear in films on a regular basis. And why should he? He had a plumb role in the Kern / Hammerstein musical Sunny, which ran on Broadway for 517 perfs in the 1925-1926 season, where he played Harold Harcourt Wendell-Wendell; he got second billing under Gertrude Lawrence in Treasure Girl in the 1928-1929 season, where he introduced the Gershwin standard "I've Got a Crush on You;" he introduced the Dietz and Schwartz song "I Guess I'll Have to Change My Plan" in The Little Show for 321 perfs in the 1929-1930 season. He also headlined and introduced the song "Louisiana Hayride" in the Dietz and Schwartz show Flying Colors for 188 perfs in the 1932 season. A very popular performer, to be able to bring 'em in during the height of the Depression. Webb and Marilyn Miller both introduced Irving Berlin's revised version of "Easter Parade" in the musical As Thousands Cheer for 400 perfs in the 1933-1934 season. He starred in the Broadway revival of Oscar Wilde's The Importance of Being Ernest in the 1939 season, and he starred as Charles in the original Broadway production of Nöel Coward's Blithe Spirit for 657 perfs from 1941 to 1943. Webb was chosen by director Otto Preminger to come out and play the role of radio columnist Waldo Lydecker for his film noir, Laura (which played the Chinese in November, 1944) with Gene Tierney. His waspish performance ("I don't write with a pen — I write with a goose-quill dripped in venom.") received fantastic reviews and remains freshly whimsical today. 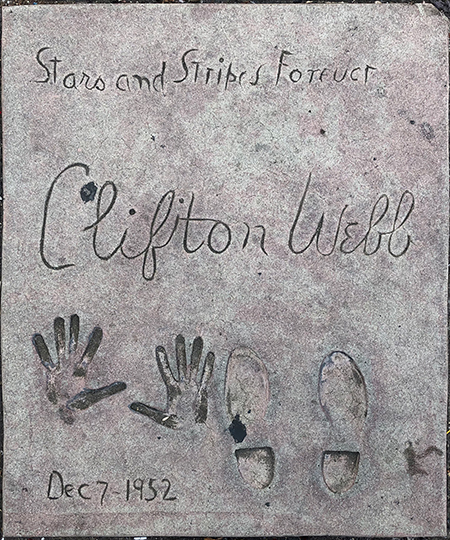 Webb was signed to a long-term contract at the Fox studio — he never worked in film anywhere else. Webb returned to Broadway for the last time for Nöel Coward's Present Laughter in the 1946-1947 season, then after appearing in the noir film The Dark Corner (which played the Chinese in May, 1946), Webb gave an outstanding signature performance as the snobbish Elliott Templeton in the film of W. Somerset Maugham's The Razor's Edge (which played the Chinese in December, 1946). The story arc for his character allowed Webb to delve into the insecurities underlying the haughty. Webb, comfortable with comedy, played a snide babysiter in Sitting Pretty (which played the Chinese in April, 1948); the film was so successful, that a sequel was done immediately. Mr. Belvedere Goes to College (played the Chinese in May, 1949), was another monster hit. Webb appeared as the head of a large, efficient, family in Cheaper by the Dozen (which played the Chinese in April, 1950) with Myrna Loy, and For Heaven's Sake (played the Chinese in December, 1951) with Joan Bennett. The third and last Belvedere film was Mr. Belvedere Rings the Bell (played in August, 1951). Dreamboat (released in July, 1952), had Webb playing a former silent movie star, now an academic, try to ignore his past. Webb starred in the Technicolor screen biography of bandmaster John Philip Sousa in Stars and Stripes Forever (which would play the Chinese several weeks after his Forecort ceremony, opening on New Year's Eve, 1952). He then took on a tragic role in Titanic (played in April, 1953) as the chicken-hearted husband to Barbara Stanwyck. Later that year, Webb tackled Scouting in Mister Scoutmaster (released in September, 1953). Webb sailed into the CinemaScope years with Three Coins in the Fountain (released in May, 1954), and played a surprisingly laid-back lead in Woman's World (which played the Chinese in October, 1954). He played a military type in The Man Who Never Was (released in March, 1956, and Boy on a Dolphin (played the Chinese in April, 1957). He starred in The Remarkable Mr. Pennypacker (released in January, 1959), and Holiday for Lovers (released in July, 1959). His final film was Satan Never Sleeps (released in February, 1962). Webb was in declining health his last few years, succuming to a heart attack at his home in Beverly Hills in 1966, at the age of 76. Grauman's Chinese Theatre, Hollywood, California. Clifton Webb Forecourt ceremony, Sunday, December 7, 1952. 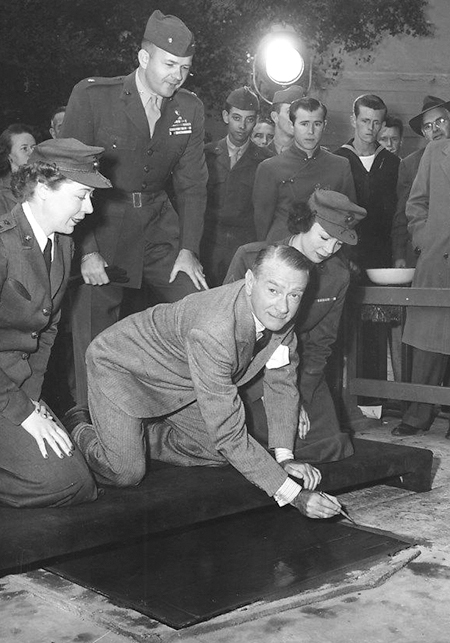 Captain Dorothy McDowell, USMC, Major William E. Barber, USMC, and Technical Sereant Gladys Bolkow, USMC, look on as Clifton Webb makes his inscription.